* Our inventory is always changing to make room for new and unique products and seasonal changes. Substitution may be made but we never compromise quality. All substitutions will be of equal or greater value. Full assortment of some of our favorite treats; chocolate drizzled popcorn, chocolate covered pretzels, homemade cookies, chocolate fruits, cashews and trail mix, non pareils are paired with some savory selections too. An abundance of enjoyment! This is a keeper! 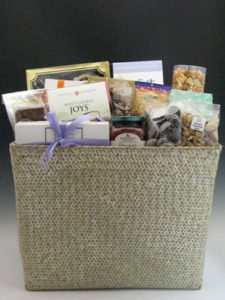 A stunning basket to keep and use all year round is delivered with an assortment of treats to celebrate any occasion. Cookies, mints, nuts, chocolates complete a great gift. 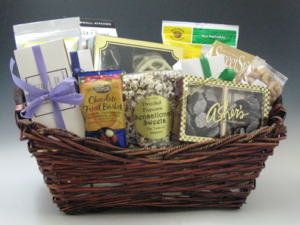 Indulge someone with this large basket overflowing with our fine chocolates, cookies, snack mixes, nuts, pretzels, preserves and crackers. 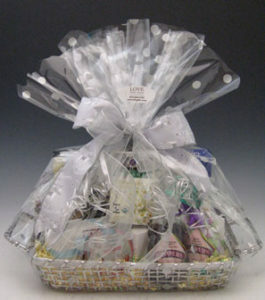 This basket is usable for home or office and is delivered beautifully gift wrapped for any occasion. 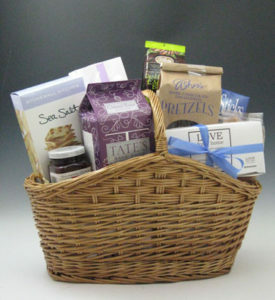 Natural basket holds a variety of tasty treats and our suggestions include chocolate covered pretzels and our homemade cookies too. This basket looks great filled. Make someone’s day when they’re under the weather by sending some Love From Home. 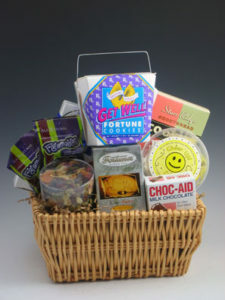 A basket full of chocolate band-aids, get well fortune cookies, teas, baked goods, and chocolates will put anyone on the road to recovery. …get the idea? 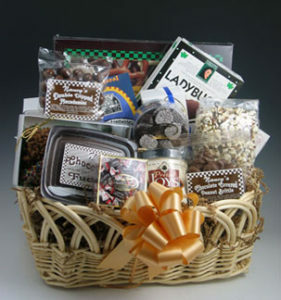 We have what it takes to send a rich and decadent chocolate feast ! 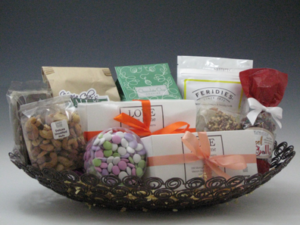 Chocoholic Baskets $50.00 and up. A basket brimming with everything needed for a real feast. 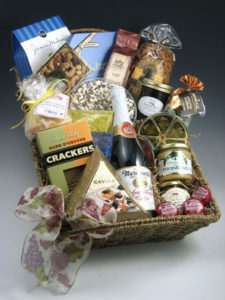 Caviar, hore d’oruvre crackers, champagne mustard, cheese straws, gourmet nuts, chocolate drizzled popcorn, gourmet pretzels, coffee, antipasto spread, and Martinelli’s sparkling cider are just some of the combinations we can put together in a stunning basket and elegantly gift wrap for someone special. Open weave pewter baskets are always a nice touch. They come in 3 sizes and look great filled with our tasty selections. 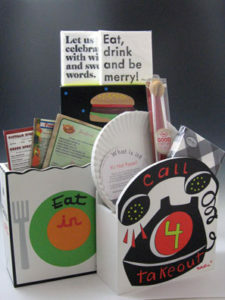 We all have those menus cluttering a drawer somewhere and this is a fun and decorative way to have them all in one place. Great new home gift, bridal shower, first apartment, new Mom; anyone you know who doesn’t have the time to cook every day. Add some napkins, chopsticks, and melamine plates or sweet and savory food selections. A unique gift. 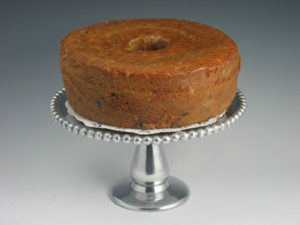 Beautiful silver cake stands are the perfect way to send our delicious homemade Jewish Apple, Lemon and Rich Chocolate pound cakes Our cakes are decadent and will serve 12-14 people and the cake stands will be enjoyed long after the cake is gone. A full selection of our homemade cookies is always a big hit. 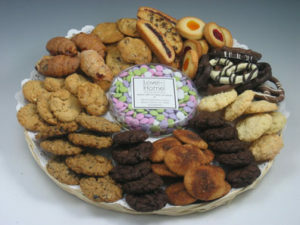 Assorted schnecken, very very chocolate, oatmeal cherry, sand tarts, kmish broit, butter cookies, chocolate chip, lemon shortbread, thumbprints, brownie bites, coconut choc chip are just some of the varieties we offer on our trays. Great gift for many occasions; thank you to Doctor and nursing staffs, new business opening, office and home parties, showers, professional staffs are just some suggestions for sending one of our trays. 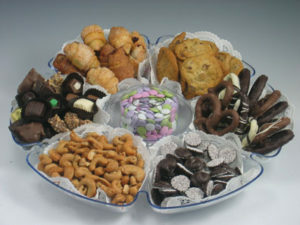 Acrylic sectioned trays are filled with a variety of goodies to please the crowd. 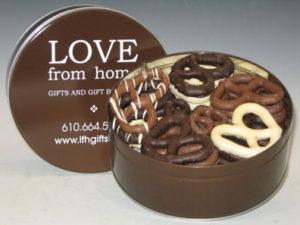 Chocolate covered pretzels, cookies, nuts, mints; chocolates are some of the combinations to be enjoyed. Trays come in two sizes. 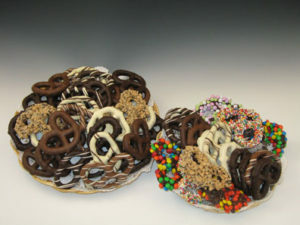 Best selling chocolate covered pretzels are arranged on a wicker tray and are a real crowd pleaser for any occasion. Milk, dark and white chocolate or sprinkled with gourmet toppings; this is always a winner.